Today is our thirty-first wedding anniversary. We got married on a hot steamy June night in the Washington DC area. During the official part of the event, the skies opened up and it poured. After that, the heat and humidity dissipated and we had a really fun party. It has been a productive partnership. We have three fantastic children and an array of business and personal interests that we have pursued, often and increasingly together. We plan to spend the day together and not work. So other than this brief public celebration of matrimony and love, this is all you are going to get from me today. But if you are interested in the crypto/blockchain/token sector, you may want to check out something I wrote on USV.com and posted overnight. It is about our dual strategy of investing directly in companies and projects and also in token funds. You can read that here. 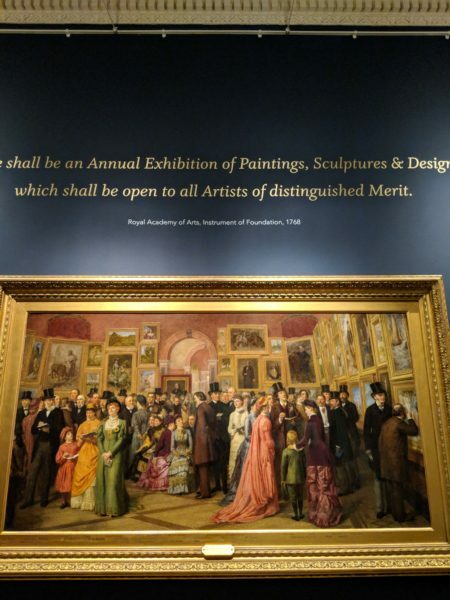 Two hundred and fifty years ago, in 1768, The Royal Academy in London decided to hold an annual exhibition of “paintings, sculpture, and design” that would be “open to all artists of distinguished merit” and so began the summer exhibition. We’ve been attending the summer exhibition on and off for something like ten years and I really love it. We went today, which is the 250th annual event. As you can see in the photo above, which is from maybe 150 years ago, they pack the walls with art. You can barely see the walls there is so much art on them. 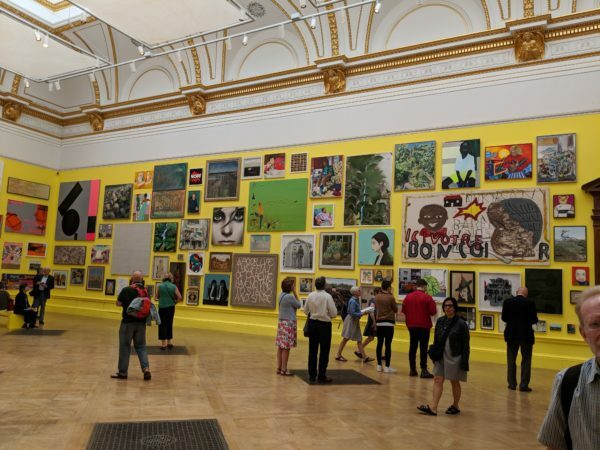 But the thing I love most is the way they hang an unknown twenty-year-old painter next to a Hockney. It really speaks to me and represents an egalitarian approach that is rare in the art world and the worlds beyond art. You can buy many of the works at the summer exhibition and we have done that a few times over the years. Not today, as many of the works we liked had been sold or were not for sale. But I like that it is a place you can collect and many of the works are not particularly expensive. If you live in London or the UK, you have likely gone. If not, you should. And if you are not from the UK but find yourself in London this summer, you should go. It can be exhausting to try and stay caught up on every new tech company being started. The Gotham Gal said me to yesterday, “everyone is an entrepreneur these days.” She’s right about that directionally although most companies have employees who are not founders so it is not exactly correct. The rapid expansion of tech startups and the entrepreneurs who create them has been building for fifteen years, or possibly twenty-five years if you include the early Internet exuberance and the period of disillusionment that followed. But over the last ten years, in particular, we have seen a number of factors come together to make for an environment where “everyone” can do a tech startup. We have more and more software engineers and related skillsets around the world as education systems are starting to respond to the market demand for this talent. This is particularly true in Asia and other parts of the rapidly developing world. But it is also increasingly true in the developed world. Our portfolio company Stack Overflow, which serves software engineers almost exclusively, sees 31 million people a month now, up from 22 million five years ago. That likely overestimates the number of globally employed software engineers but it is indicative of the vast number of people solving problems in software right now. We also have more support systems for entrepreneurs than we did ten years ago. Paul Graham and Y Combinator were the innovators and first mover in the market for entrepreneurship support systems that are market-based and for profit. That model has been copied and evolved on all around the world and it is powerful, important, and its impacts are far-reaching. We have learned how to best support entrepreneurs early on in the life of a company which leads more people to try it and also leads to more projects graduating from these programs and getting seed funding. Which takes me to capital. We now have more angel and seed and venture capital being invested in startups every year than ever before. It took a long time, almost twenty years, to pass the go-go years of 1999 and 2000, but pass it we have and even though many see that as a sign that we are in bubble territory again, I am not one of them. Technology innovation is happening in all sectors of our economy and all parts of the world. I think the expansion of capital being deployed into startups can continue for some time to come. So there are more skilled people to help an entrepreneur build the thing they want to build, more support systems to help them avoid the big mistakes, and more capital to allow them to invest in the business ahead of revenues and profits. And so, we are in a golden era of tech entrepreneurship where anyone with an idea can make a go of it. That does not mean that all of these efforts will succeed. They won’t. Think of this golden age as a time of rapid experimentation in which every problem will be attempted to be solved in many ways. Most will fail. Some will succeed. And we will see multiple successful approaches to solving the same challenges. The good news is that all of the systems that feed these startup efforts, the talent market, the accelerator programs, the capital markets, and the entrepreneurs themselves, understand that these are experiments and that most will not succeed. For the most part, the market has evolved to a point where the economics of each input system has built the loss ratios and likely payouts when you win into their pricing structures. It is not perfect by any means. We may, for example, need to do more for the very early employees. And the rapid inflation in financing valuations may need a pullback if those new economics don’t work long-term for the capital markets. But if we are thinking about society, and I mean our global society, not just the US, the result of this era of rapid experimentation is likely to be progress on important, and also mundane, human needs. None of this makes it any easier to try and stay on top of all of this. It seems to me that the only way to do that is to pick a subset of the tech sector and focus just on that and let others take on the challenge of doing the same on another sector. It has gotten way too big for anyone to be able to stay on top of it all. But when you feel overwhelmed and wonder what will come of all of this entrepreneurship mania, I would urge you to think of all the good that will come of it. Lord knows we need it. It is fathers day today. And I thought I’d write a bit about something that is really bothering me. But, this policy of separating children from their parents at the border really bugs me. The NY Times has a good report up on their homepage right now about how we got to this place. I understand the need and the desire to protect our borders and enforce our immigration system, even though I believe we are being way too restrictive in terms of who we let into our country right now. But the law is the law and until we have a new law, we need to enforce the existing law. I get that. But the children are not the ones making the decisions to violate the laws. And yet they are being punished just as much, possibly even more so, than their parents. Kelly says “The children will be taken care of — put into foster care or whatever” as if it is no big deal to forcibly separate a child from his or her parents. It is a big deal, a traumatic event with long-term implications for that child. Many of us in this community are parents who have cared for and nurtured our children, loved them, supported them, and made them feel safe. We know what that bond is between parent and child, and we know that ripping it apart is an awful horrible thing to do and that we should not be doing it. On this Fathers Day, let us all say to our government “no more.” We must end this immoral and unjustifiable policy and we must end it now. Ideally today. There is no better day, other than Mothers Day, to do that. I wrote about Ether’s big day yesterday. In this podcast, Laura Shin and Coinbase’s Adam White, who runs the institutional business there, talk about the Ether news and Coinbase’s institutional business. It’s a quick 20min listen. For me, this is not about Ether, but about the fact that a token can be used to raise capital (the “fundraising that accompanied the creation of Ether”) and at some point no longer resemble a security in the eyes of the SEC. That last point is super important because as my colleague Nick tweeted out last night, we don’t want Bitcoin and Ether to have the advantage of being the only tokens that are not deemed to be securities. We want a hyper-competitive market where the best protocols win on the merits, not because some regulator likes them better. But all in all, it was a good speech and a good day for crypto. It is clear that the SEC is trying to define some clear lines in the sand under which the decentralized world we all want to see happen can happen. And they are also trying to make sure that bad actors can’t skirt securities laws by simply claiming they are doing a token offering. In yesterday’s post, which seemed to touch a nerve, something I certainly seek to do from time to time, I mentioned the “talent organizations” of our portfolio companies. These are the people who help a founder/CEO build and lead the people who make up the company. It’s an undervalued and under-discussed function. I have heard multiple founder/CEOs tell me that the biggest sigh of relief they had in building their companies was when they finally hired a really strong leader to sit at their side and help them with the people side of the business. It is not even accurate to say “people side of the business”. People are the business! I recently listed to two Reboot podcasts in which my friend and former partner Jerry Colonna talked with two people leaders, Nathalie McGrath at Coinbase, and Patty McCord, former people leader at Netflix. It is worth spending the almost two hours it will take to listen to these two podcasts. What you will hear from Nathalie is the challenge of marrying a high stress, high performing culture and the concept of work-life balance. It is a near-impossible challenge, but simply trying to make it so is a where you must start. You can’t fake it. It has to be something you want to do and need to do. What you will hear from Patty is a disdain for the platitudes and processes that you get from most organizations. She and her partner in this work, Reed Hastings, wanted to do it their way and in the process created a culture that is the envy of many tech companies. And, I hope, you will come away from the two hours of listening, with an appreciation for the job of leading the people team. The people who do this work well are rare and valuable and if you don’t have one by your side, you should go find one. I am a fan of looking at something from all sides and understanding how each side thinks about it. Consider a neighborhood school. There are students, parents, teachers, administrators, non-teaching staff, taxpayers, the community, homeowners (whose home value is impacted by the quality of the school), and possibly other stakeholders. In theory every one of those stakeholders has a vested interest in the success of the school but in reality there is often conflict between them. The teachers would certainly welcome a pay raise, for example. But the taxpayers may not. Or maybe they would because it would keep the quality high and thus the values of their homes. What if the school wanted to start later and end later? The parents might oppose it because it would make it harder for them to get to work on time in the morning. But the teachers, administrators, and non teaching staff might welcome it because they would find it easier to get to work on time in the mornings. All complex systems have many stakeholders and while they all want the system to succeed, because they have a stake in it, they rarely view success in the same terms. Stakeholder analysis is extremely helpful in running a company and governing it (the work of the Board). And the stakeholders of a company are not just the stockholders. Even when a Board and management is tasked with acting in the best interests of the stockholders, it is wise and prudent to act in the best interests of all of the stakeholders. Doing so, however, is often impossible because of these conflicts between stakeholders. Done properly, a stakeholder analysis attempts to determine what each and every stakeholder desires and the impact to them of an important decision. It is like a scorecard. It is often helpful to look at short term, medium term, and long term impacts. I find that it is often the case that conflicts are the most extreme in the short term and that if you can frame a decision and the impact of it over a very long time horizon, it can be easier to get alignment. But regardless of whether you can get alignment, a CEO must act and act decisively. And a Board must make sure that the CEO is acting wisely and in the best interests of the stockholders and stakeholders. So doing a stakeholder analysis, understanding where the issues are and will be, and making a fully informed decision is the best course of action. And you will want a communication plan to mitigate the fallout of the decision as much as possible. You never want to surprise or be surprised by your stakeholders. They may not like you, agree with you, or even support you. But they must be understood, respected, and considered in your decision making process.